A team of scientists has discovered that Basking Sharks – a species often considered languid and docile – can 'jump' to the same heights, and with the same speed, as Great White Sharks. A research group used video analysis of both species to estimate vertical swimming speeds at the moment of leaving the water. They also fitted a Basking Shark with a device which allowed them to record speed and movement, with the results showing that they can match their famously strong and speedy cousin. Good numbers of Basking Sharks are found off the shores of Cornwall, Ireland and Scotland in the summer months (Green Fire Productions). 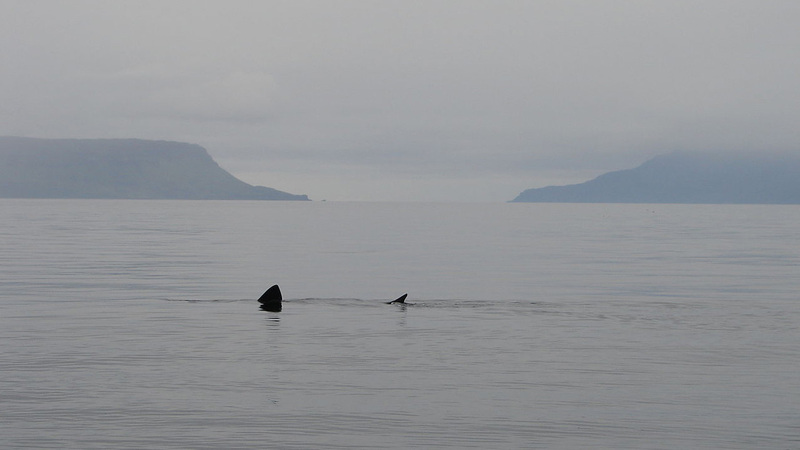 The fitted device recorded one Basking Shark accelerate to the surface from a depth of 28 m in just over nine seconds, and 10 tail beats, breaking the water at nearly 90 degrees. The shark cleared the water for one second, peaking at a height of 1.2 m above the surface. To achieve this, the shark displayed a six-fold increase in tail beat frequency and attained a top speed of approximately 5.1 m/s – more than twice as fast as the average competitor in the Olympic men’s 50 m freestyle swim. Footage shot from boats and the land were used for the video analysis, and they showed both shark species breaching at similar speeds. 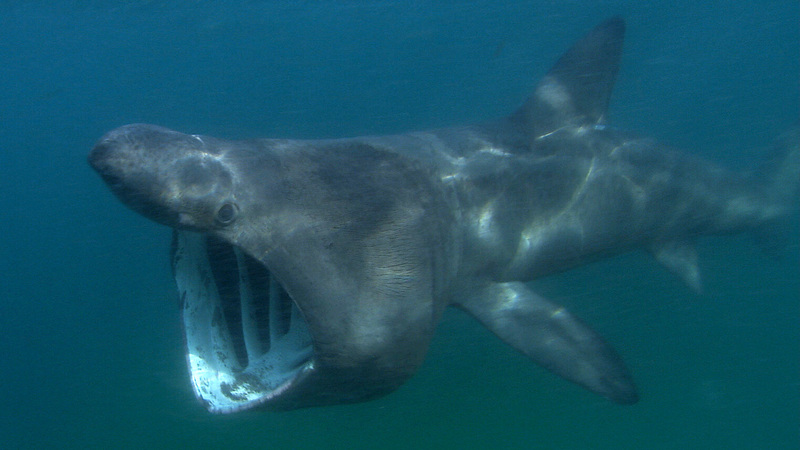 The Basking Shark videos were recorded at Malin Head, Co Donegal, Ireland, with the Great White Shark footage obtained in South Africa. The latter was done as the sharks predated Cape Fur Seal decoys. The research team comprised Queen’s University Belfast, University of Roehampton, Trinity College Dublin, University of Cape Town, Irish Basking Shark Study Group and the South African Institute for Aquatic Biodiversity. Lewis Halsey, a reader in the Department of Life Sciences at the University of Roehampton and one of the scientists involved, said: "The results of the research put the Basking Shark in a new athletic light. "While there are no recorded incidents of them being of danger to swimmers or small boats, unlike the Great White Shark, we now know they do have an impressive ability to swim at great speeds and jump clear of the water." Basking Sharks are typically observed moving slowly at the water surface as their feed, their large fins extremely obvious above the water (Antony Stanley). Johnston, E M, Halsey, L G, Payne, N L, Kock, A A, Iosilevskii, G, Whelan, B, & Houghton, J D R. 2018. Latent power of basking sharks revealed by exceptional breaching events. Biology Letters, 14 (9): 20180537 DOI: 10.1098/rsbl.2018.0537.